It’s been a busy week at ALS (when isn’t it!) but the lead up to a trade show always adds to the existing pressures of building customers orders. As always we’ve had our last-minute worries but the lorry has been loaded and is on its way to the PPMA Show at the NEC in Birmingham, where for three days next week Tuesday 25th – Thursday 27th September, we shall be demonstrating a range of labelling, coding and marking equipment and trying to give visitors an overview of our product handling and special-purpose design abilities. All our machines are fully working demonstrations, which we have always prided ourselves on – no static displays from us! If you are a machine builder yourself, you will know what’s involved in showing off industrial equipment in the artificial surroundings of an exhibition stand but I think most of our visitors appreciate the efforts we go to, in presenting working exhibits. This year we have also teamed up with a few partners that we share joint customers with or who have complimentary equipment to ours and so we are happy to be demonstrating an ICE thermal transfer coder from Clearmark Solutions and a box tape sealer from Endoline. 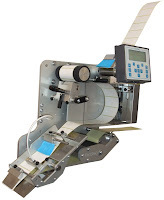 FastPaQ labeller – still the World’s fastest intermittent self-adhesive label applicator – we can “only” show you it dispensing at 200 metres per minute at the show but it can go to 375m/min (3,000 labels per minute). It really opens up new opportunities for labelling onto high-speed continuous material, label webs and carton production. Liner-less Labelling – self-adhesive labelling without any waste backing liner. We have two exhibits; high speed product labelling at 200bpm, a typical front and back labelling application and security seals for boxes and cartons, applied using a case sealer: it tapes, seals and with an EAS security tag underneath, it also protects the product from theft from a store. The security tag can be RF or AM – or even RFID. Security Tagging – using Self-Seal Tags, DVDs, console game boxes and other media can be secured around three sides, sealing the product case and protecting the already pre-embedded security tag underneath. Our machine shows this being applied at rates of 100 per minute. Outer case labelling – Firstly, an ALS 204 with a sophisticated thermal transfer ICE coder fitted provides one method of coding labels prior to application. The second is our new ALX 736, the 6-inch version of the ALX 730 series Print & Apply labeller. The ALX 730 range are probably the fastest “full-label” print & apply labellers available, with direct wipe-one application speed of up to 50m/min !!! Semi-Automatic labellers – these are sometimes the less shouted about machines but none the less, provide an efficient and practical alternative for those that require accurate, repeatable labelling for volumes not high enough to warrant fully automatic product handling, yet high enough to make a real difference when manual labelling becomes too tiresome. Our “EP” model presses labels onto products placed in a jig by hand, while our “MRU” model is for round containers and bottles. Whatever your labelling, coding or marking requirements, we look forward to meeting you on stand C20 at the NEC in Birmingham next week.